DU SOL Admission 2019 Online Form: Delhi University’s school of open learning offers various graduate and postgraduate programs to the students, the aspirants who are not able to study in regular programs can get admission in Delhi University school of open learning through open schooling programs. DU SOL provides BA, B.Com etc. courses to the aspirants and every year approx. four lakh students register for DU SOL Application Form. Aspirants can download the DU SOL Application Form 2018 on the official website of DU SOL. The DU SOL Online Examination Form will be available from the month of July 2019 and the deadline for the application form is in the month of August 2019. The aspirants who are interested in taking admission in DU can apply for the DU SOL Registration Form for the 2019 session from June 2019 and the last date for the submission of the form is July 2019. Aspirants who are not able to take regular admissions can apply for the DU SOL or Delhi University School of Open Learning. There are some steps to follow for the online submission of DU SOL Admission Form 2019. The aspirants have to follow the official website i.e. sol.du.ac.in. Aspirants have to open the student link from the notification panel. Then they have to click on the admissions to apply online for the application form. Now attach the scanned copy of documents, photograph and signature with the application form. Download and also take a print out of the generated application form. Educational Qualification: Aspirants must have passed the 10+2 with minimum 65% marks for BA (Hons.) English and have scored more than 50% for all others. The Application form will be submitted in both online and offline modes aspirants from EWS and EOC category can fill and submit through the form offline mode. There will be relaxation for the aspirants of SC/ST/OBC or you can follow the link given below. B.Com. Programme & B.Com. (Hons) M.Com. Rs.100 will be charged from the aspirants filling and submitting the form offline and there no charge for the online submission of the form. 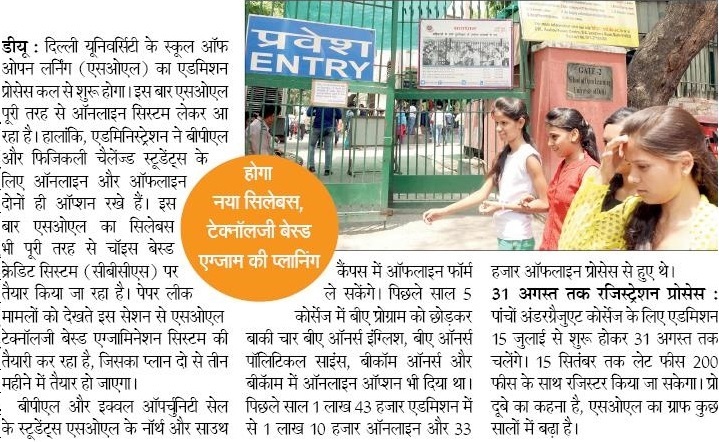 Aspirants who are interested in taking private admission in du, they can complete the DU SOL Registration 2019 in the month of June and the last date for the form is in the month of July. It is a good opportunity for the aspirants who cannot take admission in regular courses. The DU SOL offers many graduate and postgraduate courses for the regular as well as for private aspirants. For feedback and more queries regarding the DU SOL Admission Procedure 2019, you can contact us by commenting on the comment section given below.